Cook it once, eat it twice: tonight’s dinner extras transform into tomorrow’s lunch. That’s thanks to special added ingredients that can easily be heated up, even at the office (your coworkers will be amazed, trust us). 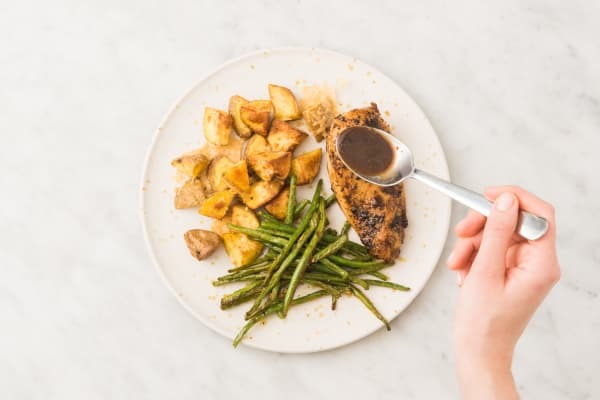 For the first meal in this 2-in-1 recipe, you’ve got chicken, green beans, and potatoes with a bit of balsamic and Parmesan for an Italian accent. 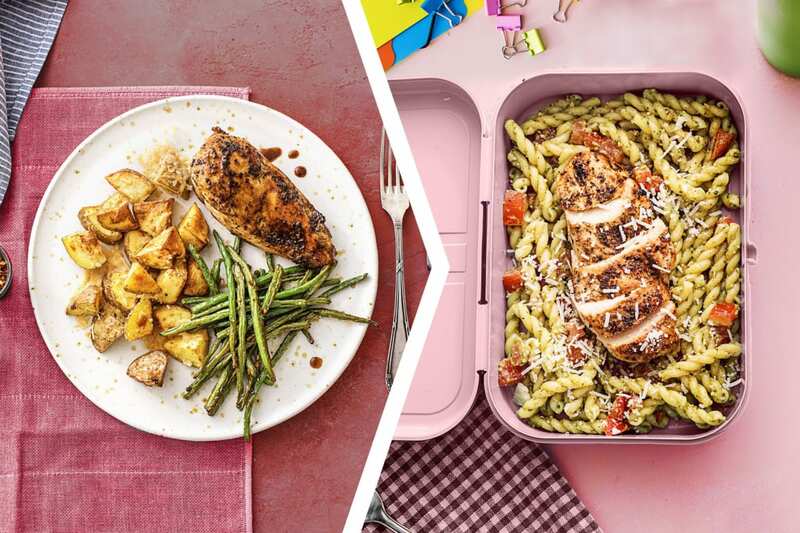 The next day, it turns into a pesto pasta lunch that comes together with just a few stirs. Adjust rack to middle position and preheat oven to 450 degrees. Bring a large pot of salted water to a boil. Wash and dry all produce. Dice tomato. Dice potatoes into 1-inch pieces. Toss on a baking sheet with a large drizzle of olive oil, salt, and pepper. Roast until lightly browned and tender, about 15 minutes. Meanwhile, pat chicken dry with paper towels; season all over with salt, pepper, and Tuscan Heat Spice. Heat a large drizzle of olive oil in a large pan over medium-high heat (use a nonstick pan if you have one). Add chicken and cook until browned and cooked through, 5-6 minutes per side. Turn off heat; transfer to a plate and set aside. 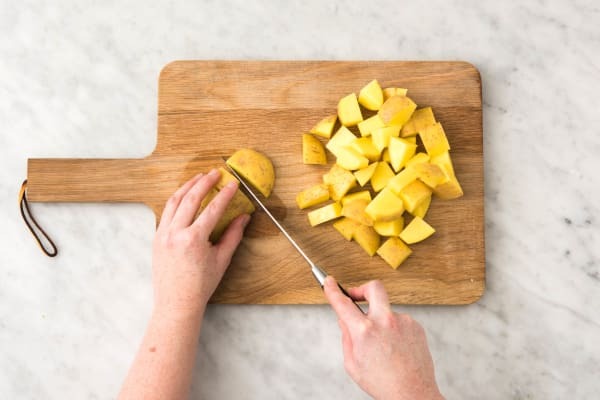 Once potatoes have roasted 15 minutes, remove from oven. Toss with half the Parmesan and push toward one side of sheet. Toss green beans on other side of sheet with a drizzle olive oil, salt, and a pinch of chili flakes (use more if you like it spicy). Return to oven and roast until potatoes are very crisp and green beans are tender and lightly browned, about 10 minutes. Once water boils, add gemelli to pot. Cook until al dente, 10-12 minutes. 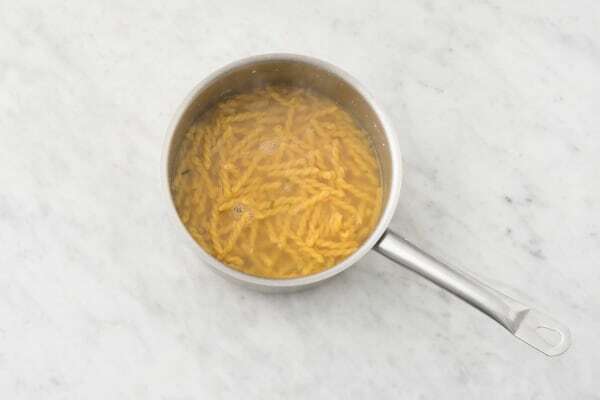 Reserve ¼ cup pasta cooking water, then drain gemelli and return to empty pot. Meanwhile, add balsamic glaze, stock concentrate, and ⅓ cup plain water to pan used for chicken. Simmer over medium-low until thickened, 3-4 minutes. Turn off heat and stir in 1 TBSP butter. 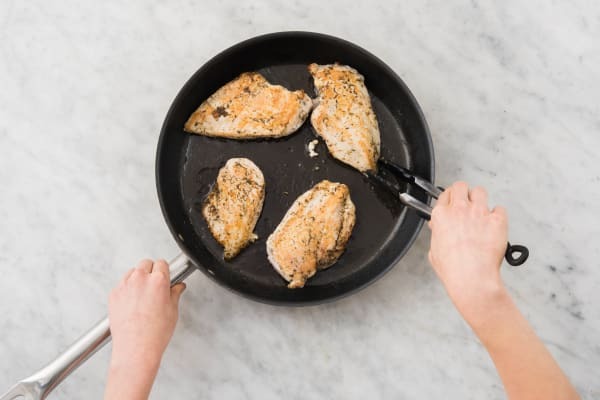 Add 2 chicken breasts to pan and flip to coat in sauce. 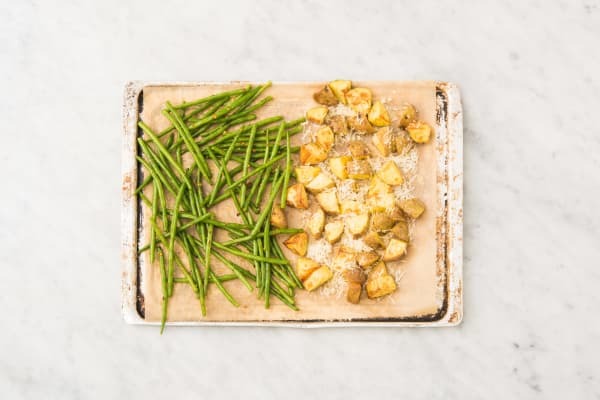 Divide potatoes and green beans between plates. Top with chicken, then drizzle with remaining sauce from pan and serve (save the remaining ingredients for lunch). 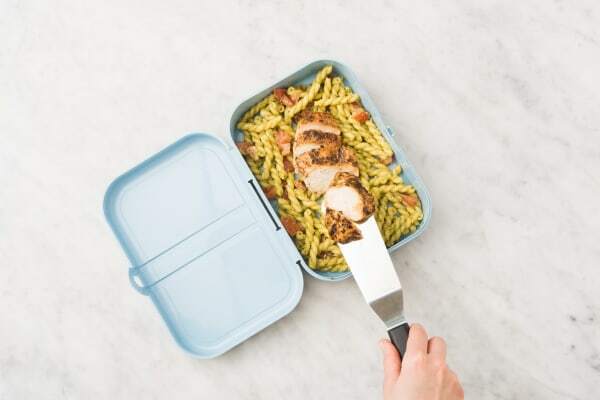 When ready to prep lunch, add pesto and pasta cooking water to pot with gemelli and toss to coat. Stir in tomato. Season with salt and pepper. (TIP: Add chili flakes to taste for heat.) Divide mixture between two reusable containers. Slice remaining chicken and arrange on top of pasta. Sprinkle with remaining Parmesan. Keep refrigerated. Heat in a microwave on high for about 2 minutes before eating.